Complete the form below to request the use of a Stinger bus or Tech Trolley. Please complete a separate form for each vehicle requested. For more information visit our Rental page and for further questions, please contact our office directly. Requests must be made no later than one week prior to event. During the academic school year rentals are not provided Monday through Friday between the hours of 8:00 a.m. and 5:00 p.m.* (some exceptions may apply). Alcoholic beverages are not permitted on Institute vehicles. Rentals will be approved based upon vehicle and/or driver availability. Directions to off-campus locations must be approved by the chartering party. Cancellations, changes, and additions require, in advance of the date of service, a 72-hour advance written notice. For campus departments, any charter service requested after June 1 will require a valid Peoplesoft number for the upcoming fiscal year. The contact person is responsible for requesting additional services and to verify start/end service times. Service that last more than 15 minutes past the estimated service hours will be charged an additional service hour. Any charter service requested after June 1 will require a valid Peoplesoft number for the upcoming fiscal year. All off-campus organizations are required to pay at least 72 hours prior to the event start time. Please visit the PTS office to pay via credit or cash. Checks may be mailed to or paid in the office. 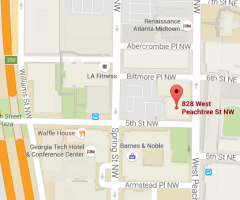 The PTS office address is 828 W. Peachtree St. NW, Atlanta, GA 30332. Office hours are Monday - Friday, 7:30 a.m. - 5:00 p.m.